Location in the zoo: Flamingo Exhibit left of entry bridge. Four to five feet tall, and can weigh anywhere from 13-16 lbs. Long, sinuous neck, and long, extremely slender legs. Bill is bent downward in the middle. Pale pink in color, with darker pink and black wings, dull yellow or yellow-gray legs with dark pink bands at the joints, and pink feet. Very gregarious, living in flocks usually numbering in the thousands. Pink coloring comes from a pigment that the animal consumes. In captivity, this pigment must be manufactured into the flamingo's food, or else the animal would be a dull buff color. Flamingos require shallow water and lots of mud; nests are built by surrounding the egg with a large pile of mud, which is then incubated for around thirty days. Comments about the flamingos of the Fort Worth Zoo. There are a total of 38 flamingos at the Fort Worth Zoo. The ratio of males to females is about one to one. The flamingos lay eggs in the early summer (there are ten mating pairs, only four of which are fertile). The Fort Worth Zoo had initiated a breeding program to hopefully help to bring about a more successful number of flamingo progeny. The flamingos are fed pellets in the water that they inhabit. These pellets, in combination with the small unicellular organisms that they filter out of the water, along with the occasional chicken mash or canned dog food treat, make up the flamingos' diet in the zoo. 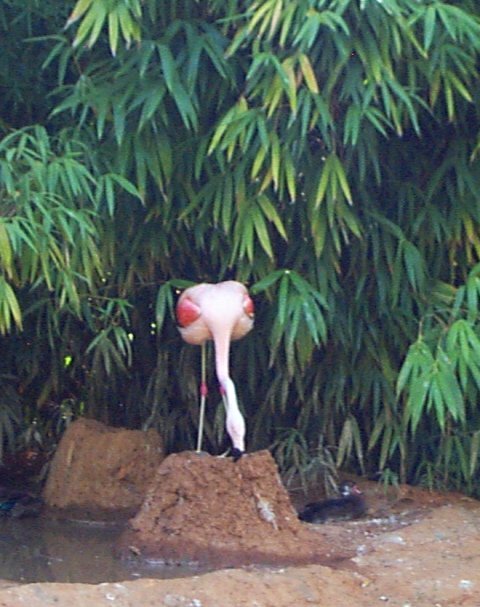 The first captivity-born flamingos at the Fort Worth Zoo were hatched in 1998, and can be viewed at the zoo now. 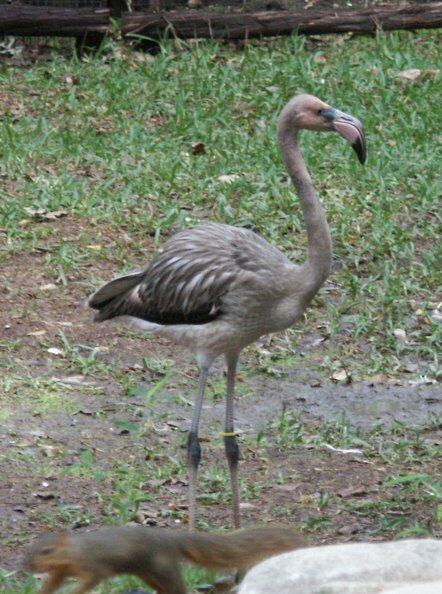 One flamingo among the group has been at the zoo since 1972!!! The flamingos at the Fort Worth Zoo are beautiful creatures, and although not everyone’s first stop when they visit, these animals can be quite entertaining and fun to watch. During my short observations, there could be heard many squawking contests, several amusing high speed races through the shallow water, two flamingos keeping watch over their nested egg, and several others just relaxing, mind you on one foot, head tucked in their wing, seemingly oblivious to all around them. Watching them perform their filter-feeding process through their beaks was perhaps the most interesting of all. The beak serves as a "strainer" of sorts, filtering mud and water out, while trapping little unicellular creatures in for consumption.